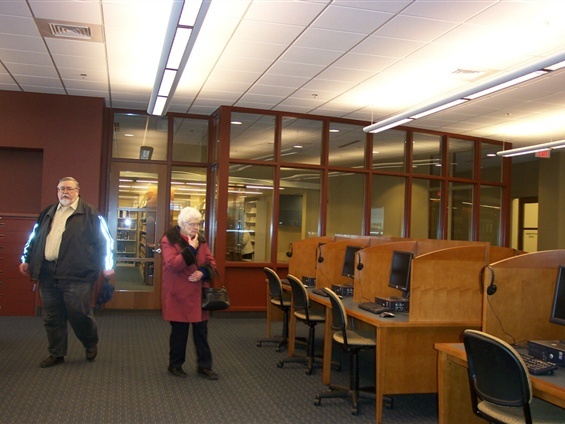 When the library is open we are in the genealogy room at the hours listed above. We help each one to find family members in a variety of ways. We have Death and Marriage records, Obituaries on micro film and Census research on Ancestry Library Edition, Heritage Quest and the census micro films that we have on hand. We have marriage and death indexes for Bay County. We have Obit Indexes for the Bay City Times in book form 1984 - 2008, and most of the Bay County Cemetery books. We have the Bay City Times and older Newspapers on micro film. We also have many records from other Counties, States and Countries in book form. We have city directories in book form and on micro film. We also have hundreds of local history books by local authors and some family genealogy books. We look forward to helping you in your research. We have four micro film readers in our room and four computers for Ancestry and Heritage Quest researching. As of 27th of Sep 2018 we will have My Heritage Library Edition replacing Heritage Quest. 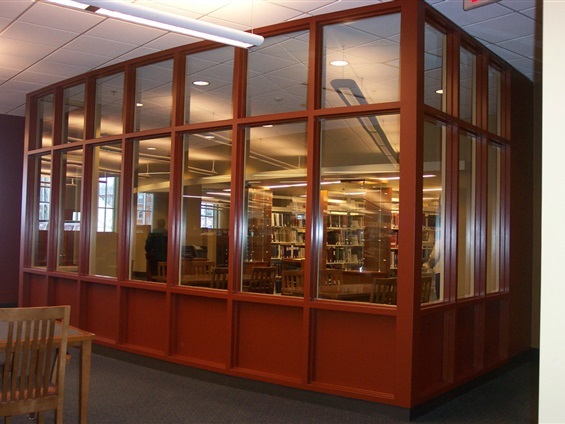 This change is offered to all Michigan Libraries. You will also be able to get this at home with your library card. 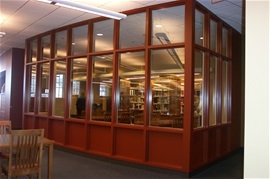 The librarians are also available to help when needed. THANK YOU TO BILL AND DON, NEW VOLUNTEERS, AS WELL AS KATHLEEN, SALLY, JUDY, CHARLIE, BILL, CAMILLE, LLOYD AND MARY AND MARY. SOME HAVE WENT SOUTH FOR WARMER WEATHER DURING OUR WINTER MONTHS. 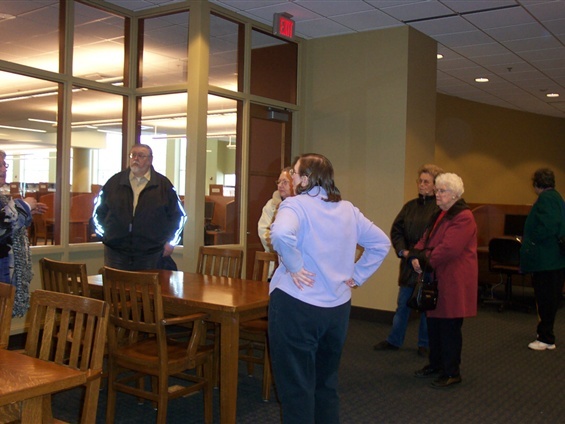 Mary gave some of our members a tour just before the opening of our new library. It's sooooo nice. 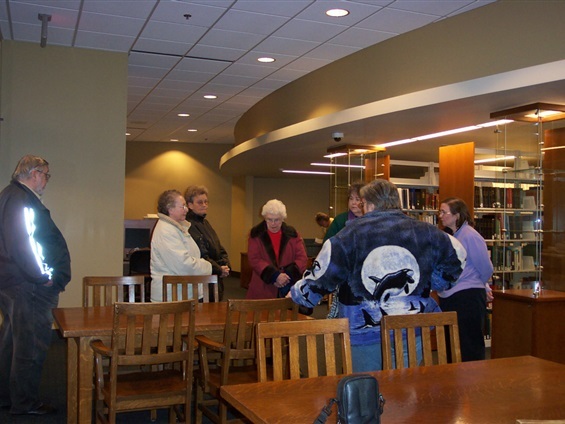 Just before the Library opened Mary took some members on a tour. Isn't it beautiful? We think so. Kathleen, Norma, Lottie, Rose, Cheryl and Mary. Gary and Cheryl standing by the two work tables. 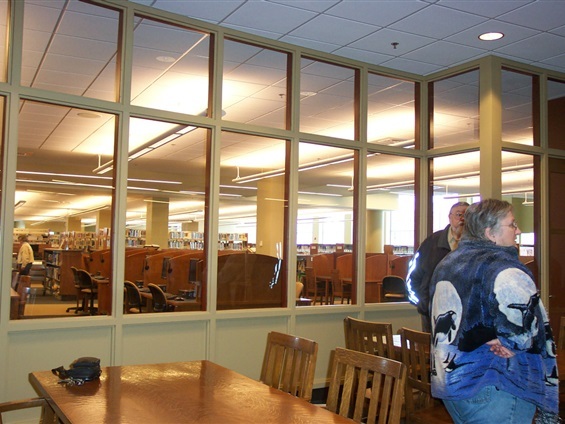 These two tables and chairs were brought from the old library for this room. Computer Work Stations just outside the genealogy room.